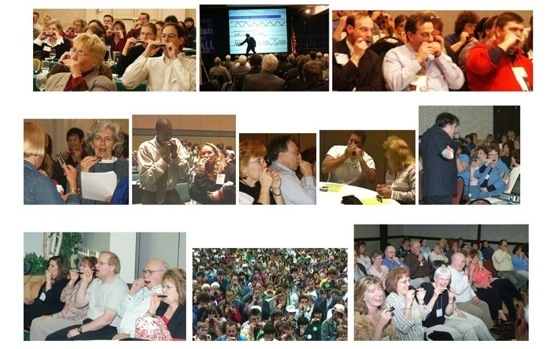 I've taught more than a million people to blow their blues away on the harmonica. And I've taught hundreds of thousands of people to meditate (with or without harmonica). And many tens of thousands of other to play guitar, tinwhistle, and percussion. At the bottom of this page are photos of a few of the hundreds of harmonica groups that I've led. I believe that one of the best ways to increase your aerobic capacity is to play the harmonica...while you exercise! Probably the best way to start your HarmonicaRobics™ practice is by walking and playing, although I like to play my blues harp while I ski and kayak, too! In fact, I like to play harmonica while doing lots of things (except swimming, snorkeling, and playing underwater hockey — although HarmonicaRobics™ helps me to do all three better). But HarmonicaRobics™ while walking is easier for most people, no matter how athletic, to start with. And as soon as you can walk and play, you can hike and play, or jog and play! 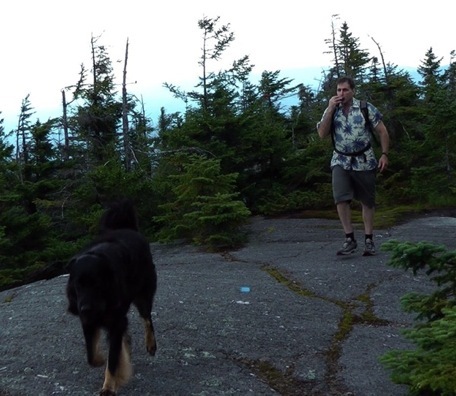 Here I am, with "Lola," at the top of the Worcester Range of the Green Mountains, Harpin' all the way, up and down! To hear me play and see a video of Lola and me, click here! Perhaps you're athletic, but don't consider yourself "very musical." With my teaching methods, you can learn to play enough blues and rock harmonica to start walking and playing within just a few minutes! Check out my books and CDs to find a method that suits your style and your pocketbook! I also have harmonica programs for People with COPD, Asthma, or Other Aerobic-Impairing Conditions. These are briefly described at www.adaptivemusic.net, and I will soon have a website up specifically for these programs. Please check out some of my websites, and if you like, contact me with the button below. My next scheduled five day Mindfulness Through Music™ workshop is at The Kripalu Center, in Lenox, MA, running from July 19- 24, 2013. Blues, Rock, Folk, C & W, and Classical Harmonica (plus Celtic Flute and Percussion)! especially for people who have tried to learn mindfulness before, without much success! Please click on this link to read about it. Or call this toll-free number 1-866-200-5203 to register. I'll also be offering a one day Mindfulness and the Art of the Harmonica: Play Blues, Rock, Folk, and Classical Music Today! at Manhattan's New York Open Center on May 16, 2015. I'll be holding an evening "Harmonica Kirtan" the night before. I'll be repeating the all day workshop again on August 23, 2015. Please click on the link for more information and to register, or call 212-219-2527 Ext. 2 to register. My groups range from a few dozen to a few thousand participants.